This article is about the county in New York. For other uses of "Chautauqua", see Chautauqua (disambiguation). Chautauqua County was governed by a board of supervisors until 1975, when a new county charter went into effect with provisions for a county executive and a 13-seat county legislature. The county council currently consists of 19 members, down from 25, each elected from single member districts. PJ Wendel is the current Chairman. Downs, John Phillips (1921). History of Chautauqua County, New York, and its people. II. Boston: American Historical Society. Retrieved 2014-04-20. ^ a b "State & County QuickFacts". United States Census Bureau. Archived from the original on July 8, 2011. Retrieved October 11, 2013. ^ "New York: Individual County Chronologies". New York Atlas of Historical County Boundaries. The Newberry Library. 2008. Archived from the original on April 10, 2015. Retrieved January 9, 2015. ^ Dean, Nicholas (2009-08-30). "Legislators Cite North-South Discrepancies" Archived September 3, 2009, at the Wayback Machine, The Post-Journal, Retrieved 2009-08-30. ^ "GNIS Feature Search for Chautauqua County, New York". ^ "New York County High Points". Archived from the original on 2013-08-08. ^ "Historical Census Browser". University of Virginia Library. Archived from the original on August 16, 2012. Retrieved January 3, 2015. ^ "Population of Counties by Decennial Census: 1900 to 1990". United States Census Bureau. Archived from the original on February 19, 2015. Retrieved January 3, 2015. ^ "Census 2000 PHC-T-4. Ranking Tables for Counties: 1990 and 2000" (PDF). United States Census Bureau. Archived (PDF) from the original on December 18, 2014. Retrieved January 3, 2015. ^ "2010 US Census". Archived from the original on 8 January 2012. Retrieved 13 September 2012. ^ McCarthy, Robert (11 April 2017). "Democrats, Republicans are a 50-50 split in Chautauqua County". The Buffalo News. Archived from the original on 12 April 2017. Retrieved 11 April 2017. 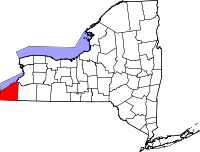 ^ "Legislature - Chautauqua County, NY - Official Website". chautauqua.ny.us.